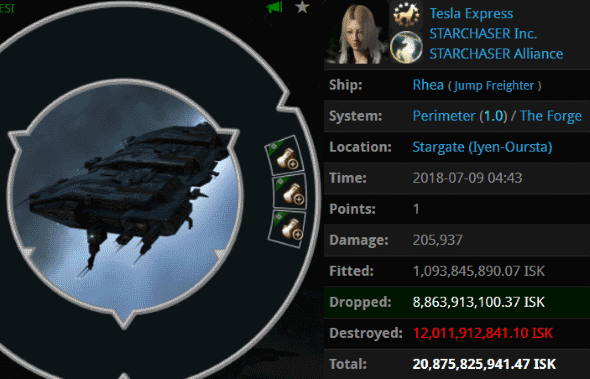 How bad do you need to be at EVE to lose a jump freighter in a 1.0 security system? 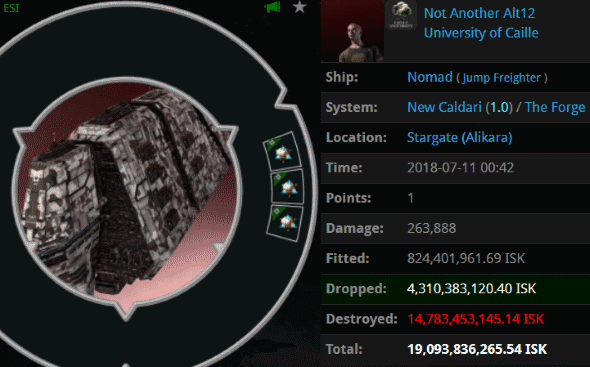 Ask Not Another Alt12, who was defeated by the New Order in New Caldari. When the carebear attempted to travel through our territory without a permit, an extraordinary gank armada was on hand to greet him: Agents Tax Collector Alison, Tax Collector Larry, Tax Collector Fuemi, Tax Collector Kimi, Tax Collector AynRand, Tax Collector Yuna, Tax Collector Shardani, Tax Collector Buck, Tax Collector BokChoy, Tax Collector Hill, Pod Destroyer Molly, Tax Collector Kittens, Tax Collector HongMei, Australian Excellence, Jayson Kusion, Jake Kusion, Jason Kusion, Justin Kusion, Taxman Daniel, Jayden Kusion, Joel Kusion, Tax Collector Stroheim, erobb, Shy Elf Trap, patyooki, Tax Collector KarlMarx, Joshua Kusion, Tax Collector Max, Joseph Kusion, Jackson Kusion, Jeremiah Kusion, Johnathan Kusion, Tax Collector Richard, tumblr ptsd, PogChampion, James BIG BONED, Tax Collector Aruka, Daniel Chanline, Serious Web Developer, brainlet, HSM Chief PettyOfficer, HSM Fleet Admiral, and HSM MasterChief PettyOfficer. Tesla Express managed to lose an even more expensive jump freighter in the Perimeter system--also 1.0 security. 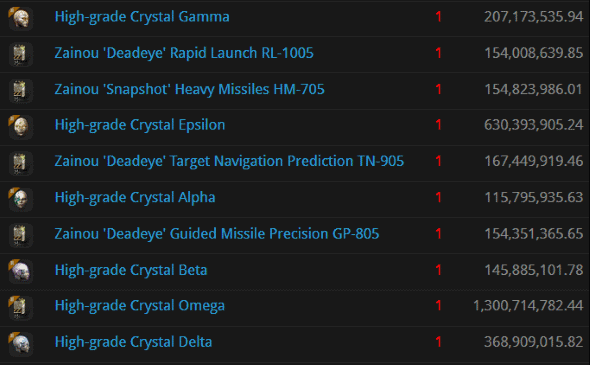 Is there anywhere in highsec our Agents don't have total command? No. Tesla was zapped by a somewhat smaller gank fleet than the previous one--but it was full of Taloses: Agents Pod Destroyer Molly, Taxman Daniel, Tax Collector Aruka, Tax Collector Richard, Tax Collector Kittens, Jason Kusion, Jayson Kusion, Tax Collector KarlMarx, Tax Collector HongMei, Tax Collector Larry, Jayden Kusion, Jake Kusion, Tax Collector Max, Tax Collector Alison, Justin Kusion, Tax Collector BokChoy, Joel Kusion, Tax Collector AynRand, Tax Collector Kimi, Tax Collector Fuemi, Tax Collector Hill, Tax Collector Stroheim, Australian Excellence, Tax Collector Shardani, Tax Collector Buck, Tax Collector Yuna, HSM Chief PettyOfficer, HSM Fleet Admiral, and HSM MasterChief. 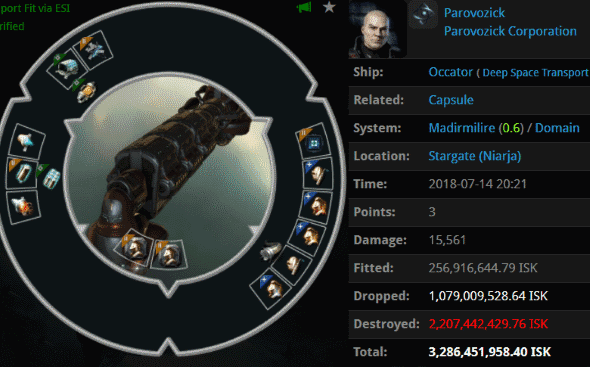 Not every carebear chooses to throw away billions of isk on a hauling ship. 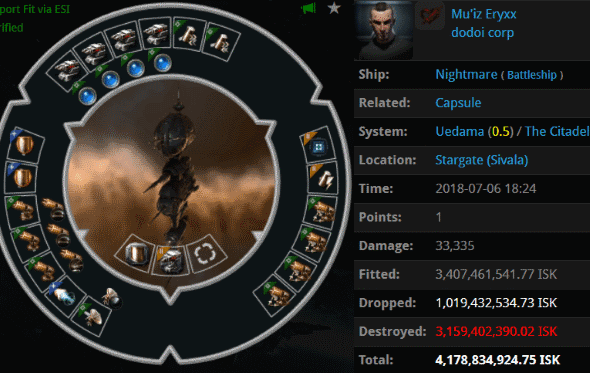 Some prefer to lose billions on combat ships, such as Mu'iz Eryxx's 4.1 billion isk Nightmare. Actually, the blingmonger's true nightmare was a flock of Kusions, and he met them in Uedama late last week. Agents Jayson Kusion, Justin Kusion, Joel Kusion, Jason Kusion, Jake Kusion, Joseph Kusion, Jackson Kusion, Jeremiah Kusion, Jayden Kusion, Joshua Kusion, Johnathan Kusion, Jacob Kusion, Jeremy Kusion, Josh Kusion, Jessie Kusion, Jeffery Kusion, Jonas Kusion, Jimmy Kusion, and Josiah Kusion made good use of stealth bombers and Catalysts to bring the nightmare to life--and the Nightmare to death. Parovozick was eager to tank his hauler as much as possible. But what's the point of tanking, if you're not willing to play the game? Parovozick went AFK and set his ship to autopilot, only to be blapped by the Tornado fleet of Agents Mongochicken, Gandor Ironfist, Throatslashar, iZaEaRl, Spazmongloid, and Elvir. Also, no tank is complete without a permit. 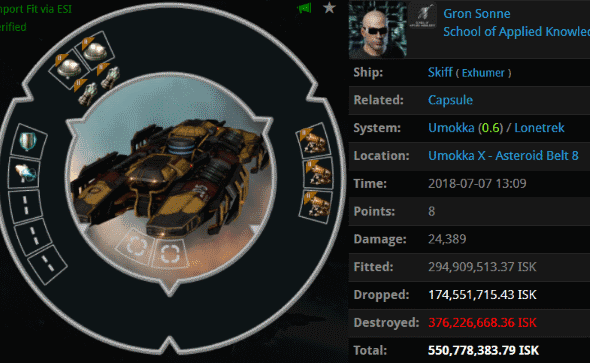 Gron Sonne must've overheard someone talking about how tanky Skiffs are. If so, he overheard the conversation in a crowded place with a lot of distractions. That would explain why Gron simply purchased a Skiff hull and never bothered to fit it. I'm sorry, but a Small Shield Booster I doesn't qualify as a tank. Agents Max August Zorn and Ernst Steinitz went to battle in a pair of Hecates late last week and "tested" the Skiff's tank. It didn't pass. 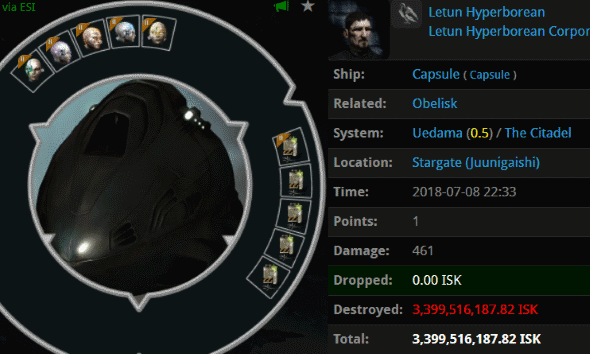 Letun Hyperborean was reeling from the loss of his 3.7 billion isk freighter when Agent holdmybeer added another 3.3 billion isk to Letun's lossboard. To be honest, Letun was probably still AFK long after he lost both the freighter and the pod. So he wasn't truly "reeling" from the freighter loss; he experienced a 7 billion isk loss all at once. I'm not sure if that's any better. Are Crystals making a comeback? Carebears, avoid the temptation to spend your money on implants like these. It's much smarter to spend your isk on mining permits instead. wow just wow. ANOTHER week of failure for antiganking. If only Thomas wasn't stealing the ag donations. That Skiff is especially painful.. I mean even by miner standards. At least he didn't have a civilian shield booster.